Serena Williams needed just one hour on Monday to remind everyone why she remains the overwhelming favorite to win the U.S. Open. In one of the most one-sided matches seen on the Arthur Ashes center court, Williams demolished Italy's Francesca Schiavone 6-0 6-1 with an ominous display of precision and power. The American showed no mercy against her opponent, who won the French Open in 2010 and was a finalist in Paris the following year, conceding just 23 points in the 60-minute romp. "I'm really excited," she said in a courtside interview. "I knew playing a former grand slam champion in the first round was a really tough draw so I decided to be super serious." As the most fearsome player of her generation, the 31-year-old Williams has made a career out of destroying her rivals but has rarely been as impressive as she was on Monday. With the New York crowd whooping and hollering in awe, Williams raced through the opening set in just 23 minutes, sealing it with a thunderous ace down the middle. The world number one jumped out to a 4-0 lead in the second leaving Schiavone cursing in desperation. Exasperated, she turned and hugged a ball boy, eliciting sympathetic groans from the crowd but not a hint of pity from Williams. The Italian did at least manage to avoid the dreaded 'double bagel' - the ultimate humiliation for a tennis professional - when she held serve in the fifth game. But it was a just a temporary reprieve as Williams moved in for the kill, reeling off the next two games to seal a second round meeting with Galina Voskoboeva of Kazakhstan. "I think the scoreline had nothing to do with the match. 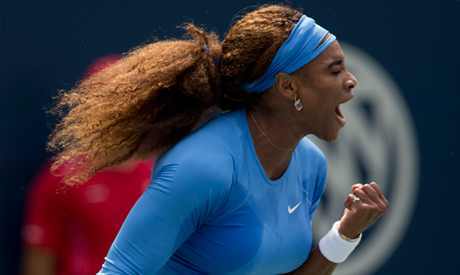 I mean, I just was able to win some key points," Williams said. "But I tell you, it wasn't very easy out there. We were both grunting and running and fighting." As a statement of intent, Williams could not have been any clearer about her ambitions at Flushing Meadows over the next two weeks. With 16 grand slams titles already under her belt, she is already assured of her place in the pantheon of tennis greats but shows no signs of slowing down. Williams won her first U.S. Open in 1999 when she was just 17. Last year, she won her fourth, aged 30. If she wins again this time, she will become the oldest female champion in New York since tennis turned professional in 1968.